Dallas, TX | New York, NY - At the 2017 AUVSI Show, Persistent Systems, LLC (“Persistent”) will introduce the Embedded Module – the most advanced, most scalable, and most efficient Mobile Ad Hoc Networking (MANET) radio in the world, now in a SWaP-timized form factor. The Embedded Module is designed for easy integration and to unite UAVs, UGVs, and sensors on a single network. In addition to providing access to the Wave Relay® MANET, the Embedded Module features an HD video encoder and onboard Android™ computer. The Embedded Module is also compatible with Persistent’s full line of Interchangeable Frequency Modules, allowing you to leverage powerful 3×3 MIMO technology to communicate further, faster, and more reliably than ever before. “We envision a networked world, with unmanned systems and sensors seamlessly communicating with teams in the field. The Embedded Module represents a major step towards a networked Ecosystem, which will permit connected people, systems, and sensors to perform autonomously or collaboratively,” said Dr. Herbert Rubens, CEO of Persistent Systems, LLC. The Embedded Module unites unmanned systems’ communication, computing, and video subsystems into a single size-, weight- and cost-effective package. The Embedded Module’s HD video encoder and onboard Android™ computer replaces specialized, separate video and computing equipment with a single device that performs the same functions but takes up less space, weighs less, consumes less power, costs less and requires fewer engineering hours to integrate. Unmanned system operators relying on Persistent’s Embedded Module can focus on what matters most: the mission. The Embedded Module is compatible with Persistent’s full line of Interchangeable Frequency Modules. A paired Embedded Module and Interchangeable Frequency Module allows operators to leverage 3×3 MIMO technology and 6W of transmit power for extremely long range communications at speeds exceeding 100 Mbps. MIMO leverages RF reflections from the radio’s surroundings and antenna placement diversity to extend range, reinforce reliability, and improve throughput. The Embedded Module’s Interchangeable Frequency Module also allows easy frequency changes as unmanned systems are deployed across the world and across industries. Additionally, as global spectrum regulations continue to evolve, the Interchangeable Frequency Module means that compliance is easier and that system design is future-proofed. Integrating the Embedded Module brings unmanned platforms into the Wave Relay® Ecosystem, where all UAVs, UGVs, sensors, and systems are networked. 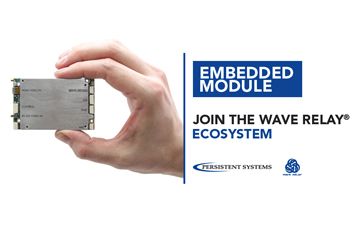 The Embedded Module uses Persistent’s Wave Relay® MANET routing to provide multi-hop IP connectivity between multiple Wave Relay® radios – Embedded Modules and MPU5s alike – extending range and simplifying deployment. Not only can unmanned systems and sensors from multiple manufacturers communicate on a common network but also MPU5 radio users can operate platforms, watch video feeds, and steer cameras. Persistent has begun accepting orders for the Embedded Module.